German Beltbuckles There are 2 products. 1933 Model SS Officier's White Metal Belt Buckle.This Was Used to SS Officer's until the end of the War,worn with a black leather belt and brocade belt for parades.The backside of the buckle is marked RZM,SS and 93/38.Dimensions diam.50 mm.Condition is good. 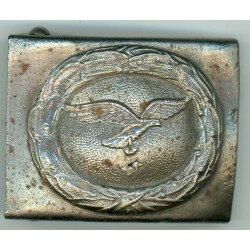 WWII German Luftwaffe Belt Buckle in a good condition. 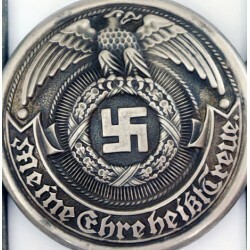 This is a German Air Force belt buckle. As manufactured during World War Two. Dimensions – apprx.63 mm x 46mm Material – of steel construction. The pictures are from actual item that you will receive.